More than a thousand activists, front-line workers, researchers, and civil and political officials from 93 countries gathered in Vancouver this week for the 17th Annual International Harm Reduction Conference sponsored by the International Harm Reduction Association. While famed for its stunning physical setting and Pacific Rim cosmopolitanism, it is the city's well-deserved reputation for cutting-edge drug law reform and harm reduction projects that makes it a natural for the IHRA. 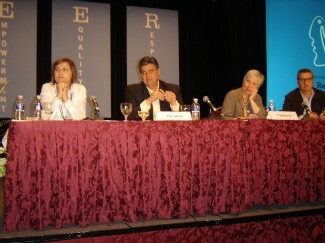 While the conference supported the city's vanguard efforts, the city also supported the conference. "I see addiction as a disability," said Sam Sullivan, Vancouver's wheel-chair-bound mayor, who just two weeks ago stirred up a firestorm by suggesting the city should provide heroin and cocaine to its addict population. "I am committed to changing the appalling way we deal with our drug-disabled people," he said to loud applause at the opening session of the gathering. "This is an issue I am committed to die on." Sullivan was followed by IHRA executive director Gerry Stimson, who congratulated the crowd on its size and vowed to make the conference more user friendly. "It's great to see how large this meeting is," Stimson said. "We've always put a great emphasis on user involvement. This is IHRA's conference, but it is also your conference," he said. Indeed, the five-day conference was replete with sessions devoted to, led by, or including activist drug users, including a session on "Advancing Harm Reduction Through Human Rights." In that session, Dirk Schaeffer of the German user group JES explained how the "network of junkies, users, and methadone people" developed over the past 15 years to become a formidable presence in German drug policy. The group now operates 10 workshops a year organized by drug users for people in rural areas and advocates for the involvement of drug users in setting policy, as well as the standard harm reduction measures. "Drug users cannot be ignored in Germany anymore," said Schaeffer. "Like all men and women, drug users have human dignity, and they don't need to obtain it by abstaining from drug use." While drug users can be seen as a threat to the social order, Schaeffer said, user groups and other harm reduction workers should work together. "All of us want to stop the criminalization of drug users and secure these people's human rights," he said. But the drug users' organizations still feel to some degree like black sheep at a conference dominated by salaried workers with official positions. One of the many satellite activities at the conference was drug user groups' efforts to form an international network, a task on which members worked throughout the week before issuing a joint declaration. Mayor Sullivan was only the first of a cavalcade of Canadians who addressed the conference on a dizzying variety of topics, sharing with the rest of the world the knowledge they had developed in years of ground-breaking work in the Great White North. In a Tuesday session on regulating drugs, Vancouver Coastal Health Addiction Services clinical supervisor Mark Haden laid out a painstaking grid of issues surrounded the regulated distribution of drugs: Should there be restrictions on sales locations or sales hours or packaging or advertising? Should buyers be licensed or required to pass a pre-test or unrestricted? Should sales be done by private enterprise or by government? Haden, a public health specialist, did not explicitly recommend any one set of restrictions, but instead noted that these mind-numbing issues are the ones that will have to be dealt with if an end to drug prohibition is to be seriously considered. Haden was followed by Vancouver drug policy coordinator Donald Macpherson, who explained the tensions among the different parts of the city's Four Pillars -- prevention, treatment, harm reduction, and law enforcement -- drug strategy. "The city has been very strong on promoting dialog on these complex, thorny issues," he said. "There is a tension here in Vancouver between the police and the other pillars, but we need law enforcement to come to the table." But for Macpherson, it's ultimately about getting the police out of the picture. "We need new laws and regulations for psychoactive substances," he said. "Our current laws create harm; prohibition does not stop sales and use. Instead, we need to incorporate public health principles." Macpherson also seconded Mayor Sullivan's call for free heroin for addicts, adding that drug maintenance should not be limited to heroin. While noting that Sullivan had asked him to pull together research to support expanding the city's NAOMI heroin maintenance pilot program, Macpherson said there was already sufficient scientific support for such programs from other countries. The program could include treating crack users with amphetamines, he added. Former Colombian Attorney General Gustavo de Greiff, now titular head of the Latin American anti-prohibitionist organization REFORMA, was characteristically forthright in his discussion of legalization and harm reduction on the same panel -- in fact he did not even speak the words "harm reduction" during his presentation. "Drug prohibition is a failure, not because I say so, but according to their own reports. What we need is legalization, which is regulation of the production, trade, and consumption of drugs," he said. The usefulness -- and the limitations -- of the North American Opioid Maintenance Initiative (NAOMI) were made clear in a moving address by Diane Tobin, head of the Vancouver Area Network of Drug Users (VANDU). "I'm a 30-year heroin addict," she said. "I knew when I was 17 I needed heroin to get through the day. Recently enrolled in the NAOMI program, Tobin said it has helped stabilize her life. "I don't have to go out scoring to get drugs illegally," she said. But while life is better now, Tobin and the dozens of other NAOMI participants face the prospect of being gradually cut off when their one-year experiment ends. 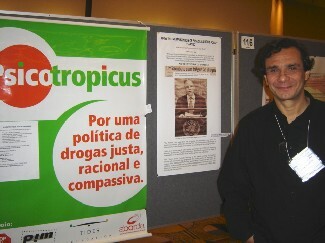 It's not only access to drugs, but being able to use them safely, said Luiz Paulo Guanabara of the Brazilian drug policy, harm reduction, and virtual users' group, Psicotropicus. "Cocaine is deeply rooted in peoples' imaginary. We have to accept this fact," he said as he discussed a Psicotropicus program that distributed hepatitis prevention kits (a plastic straw and a condom enclosed in a package with health warnings) to cocaine users. In a study of the prevention kit program, Guanabara reported, he found that 88% of cocaine snorters shared straws and 50% snorted until their noses bled, while only 36% always used a condom. Still, said Guanabara, users like and make use of the kits. Such efforts can increase the safety of cocaine users, he said. "It is a heresy to say you can take cocaine safely, but most users are unharmed," he said. "Yes, safe cocaine exists." With its 112-page program appearing as big as a medium-sized book and hundreds of sessions, satellite sessions, and related events, it is impossible to do justice to the Vancouver harm reduction conference in one article. Suffice it to say that the array of topics covered ranged across the spectrum from the mechanics of dealing one-on-one with drug users to the big picture view of global drug and harm reduction policy. As part of the big picture, the misguided efforts of the United States in the global sphere received repeated and critical attention. "US foreign policy on HIV is a hybrid religious-moral/scientific approach," complained Jonathan Cohen of Human Rights Watch's HIV/AIDS Project. "They prefer funding faith-based organizations, while they ban money for needle exchange programs, and they apply the misleading idea that abstinence is 100% effective." Still, said Cohen, the administration is uncomfortable appearing to stray too far from science, and there is room for harm reductionists to maneuver. "Demand guidance from them," he said. "Ask them just what their rules mean and how they apply. Make them justify them." The US government also drew critical attention from Pedro Chequer, former director of Brazil's National AIDS Program, who accused the US of "subverting" the war against AIDS. "Religious proselytizing in the US fight against AIDS is back," Chequer complained, noting that Brazil had been forced to reject a $39 million USAID grant because it would require Brazilian groups to abide by "religiously-based policies crafted by pseudo-moralist politicians." The conference officially ended Thursday afternoon, but related events continue through the weekend. The Vancouver-based Keeping the Door Open, a harm reduction and social justice organization, continued holding events past the official closing. Today, Canadian drug user groups will meet in an effort to form a national front. And tomorrow, Vancouver's cannabis nation will take to the streets as part of the Million Marijuana March, whose theme this year is "Free Marc Emery," the downtown Vancouver seed seller and marijuana activist now threatened with extradition to the US.